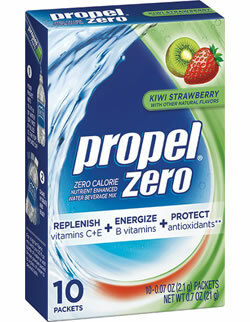 Propel Zero Energy Drink Mix is a flavored powder that is to be mixed with 16 ounces of water. Despite the labeling with the word "energize", Propel Zero contains no caffeine. Instead, it is promoting B-Vitamins as the energy enhancing ingredient. 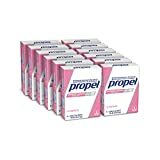 Propel Zero is one of the top selling energy drink mixes in a category where most DO contain caffeine. Propel Zero is available in 8 flavors; Lemonade, Citrus Punch, Cherry Lime, Berry, Raspberry Lemonade, Grape, Lemon, and Kiwi-Strawberry. MALTODEXTRIN, CITRIC ACID, SODIUM CITRATE, POTASSIUM CITRATE, ASCORBIC ACID (VITAMIN C), SUCRALOSE, SILICON DIOXIDE, NIACINAMIDE (VITAMIN B3), NATURAL FLAVOR, ACESULFAME POTASSIUM, CALCIUM DISODIUM EDTA (TO PROTECT FRESHNESS), CALCIUM PANTOTHENATE (VITAMIN B5), VITAMIN E ACETATE, PYRIDOXINE HYDROCHLORIDE (VITAMIN B6), CYANOCOBALAMIN (VITAMIN B12). How Does Propel Zero Energy Mix Compare? Propel Zero Energy Mix contains 0.00 mgs of caffeine per fluid ounce (0.00mg/100 ml).